Bob Moriarty: Commodities Cheapest in 50 Years, Resource Stocks Set For Big Move | Energy and Gold Ltd.
CEO Technician: Great to speak with you this morning (7-7-2017) and it’s a perfect morning for us to have a conversation. Gold and silver are both under heavy pressure and silver even ‘flash crashed’ overnight. This is a pretty poor market environment, what do you make of it? Bob Moriarty: No it’s a wonderful market environment. CEO Technician: Why do you say that? Bob Moriarty: What was the most famous thing that Nathan Rothschild ever said about investing? CEO Technician: Buy when there’s blood in the streets even if it’s your own. Bob Moriarty: Exactly. Right now we’re seeing the guys who had bought silver up at $18/ounce liquidate their positions. We had a Daily Sentiment Index (DSI) on gold at 10 on Monday, a DSI of 10 for silver on Tuesday, and a full moon coming up on Sunday. Everything is being set up either for a massive crash lower or for a turnaround. My money is on a turnaround. CEO Technician: I agree that sentiment is quite depressed on precious metals, however, do you think it’s really at an extreme such as we saw in December of both 2015 and 2016? Mark Hulbert just put up an article in which he made the case that sentiment isn’t bearish enough yet based upon the gold newsletter writers that he reads. Bob Moriarty: Hulbert is a very smart guy and he gets it right most of the time. The flaw with sentiment analysis, and perhaps fatal flaw with sentiment is what are you using as a sentiment indicator. I use a lot of different indicators and I look to see how many of them agree. If you go back to April of 2011 when silver nearly hit $50/ounce the best sentiment indicator out there was the Silver closed-end fund (PSLV) by Eric Sprott. The buyers of PSLV were paying a 26% premium to its net-asset value; so when silver was $50 an ounce PSLV buyers were willing to pay $63/ounce for the privilege of owning PSLV. I follow the Daily Sentiment Index (DSI) and I think it’s the best sentiment indicator out there right now. The 10 on the gold DSI might be enough to mark an interim low. The Rydex Funds are also quite useful and Rydex Precious Metals Funds total assets are the lowest since December 2015. There are a lot of things lining up (including the CoT data which was released Friday July 7th) including the full moon which point to, at the very least, a tradable low. CEO Technician: What have you done this week in your portfolio Bob? What are you doing and what are you looking to do? Bob Moriarty: That’s a secret. Well I will say this. I just came back from Japan and I have a major position in Irving Resources (CSE:IRV) and everything I saw in Japan said that this is a very good move. I don’t think Irving is going to double overnight but given that it takes a while to get things done in Japan I saw some extraordinarily high grade gold and silver and they have a great business plan. If I didn’t already have a major position in IRV I’d be going out and getting a position. CEO Technician: Have you purchased any physical metal in the last week? Bob Moriarty: No, but i’m getting very tempted to sell my physical palladium and using the proceeds to either buy physical platinum or silver. Commodities are the cheapest they have been in 50 years and that’s a buy signal. Platinum and silver are the cheapest they have been relative to gold in a really long time. 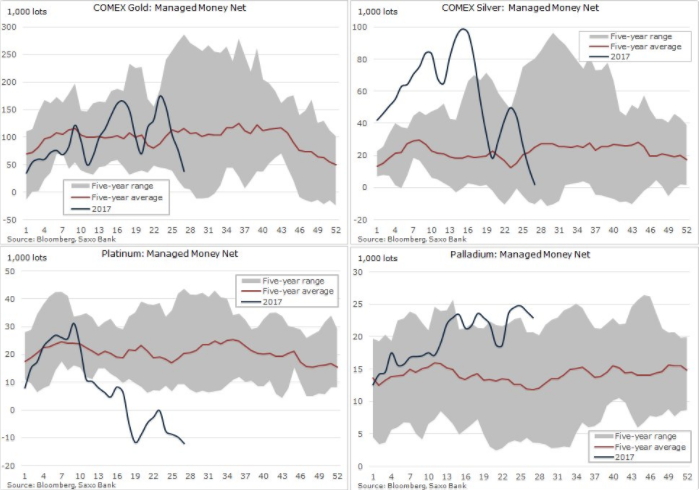 CoT positioning in platinum futures is also indicative of extremely depressed sentiment while palladium is near an overbought extreme. Meanwhile, gold & silver are both below their 5-year averages in terms of managed money long positioning. CEO Technician: What’s your feel on the junior resource sector as a whole? We’ve seen share prices continue to drift lower and the size and quantity of financings has dropped off considerably from earlier in the year. Bob Moriarty: Financings pretty much ride a roller-coaster and they follow the price of gold & silver and the sentiment on gold & silver. We made a major low in December 2015 and saw a powerful rally through July/August 2016; during that rally anybody who wanted to get financed, could get financed. And we’ve begun to see some of the results of those 2016 financings and they have generally been quite good. I stand by what I wrote a couple days ago and is consistent with the theme that we get a major low towards the end of the year and sometime in the middle of the year. CEO Technician: What do you make of the G20 and the Trump/Putin conversation which evidently resulted in a cease-fire to the proxy war going on in Syria? Bob Moriarty: The real proxy war is happening in Washington D.C. – there is a coup d’etat in progress against Trump and don’t think for a minute that I’m a Trump supporter. I was in favor of Trump only because Hillary Clinton was so obviously a criminal. As soon as Trump got elected he turned into this raging maniac, somebody needs to break his Twitter thumb or something. Putin is not a liar, he is a leader who is looking out for his country. 98% of the news media’s coverage of Trump is negative. The Washington Post, New York Times, CNN etc. are so obviously fake news they have lost all credibility. I would like to see President Trump given a chance, but the fake news media is committed to a coup d’etat. I can assure you that if Trump is overthrown the US will enter into a bloody civil war. CEO Technician: What about the North Korea situation? Evidently North Korea is much closer to an ICBM capable of carrying a nuclear warhead than most had given them credit for. Trump wants China to help but China has proven time and again that it will only go so far in sanctioning North Korea. Bob Moriarty: China doesn’t want an unfriendly neighbor on its border. Russia and China are the only countries capable of dragging North Korea to the bargaining table. I can tell you that if the US unilaterally attacks North Korea it will start World War Three. The only viable option is negotiation. CEO Technician: Last week former Fed Chairman Allan Greenspan came out and said he sees stagflation coming. Stagflation is something we saw in the ‘70s with surging food and energy prices while the economy was weak. CEO Technician: Why is he wrong? Bob Moriarty: It’s not coming, it’s already here. We’ve already got a weak economy. The retail economy in the US is a total disaster, take a look at the number of retail closures. We’ve got a subprime auto crisis going on and the defaults are already beginning to pile up. Greenspan is wrong in that we’re already in stagflation. Inflation is far higher than any of the indicators are showing; the price of oil is masking the price increases in everything else. The price of oil is going to go back up and when it does Americans are going to be in for quite a shock. The automobile industry is a disaster, the financial industry is a disaster, the banking system is a disaster. We have already started the great crash. CEO Technician: So I take it that you are negative on US stocks and real estate? Bob Moriarty: The stock market in general and real estate are priced for perfection and we live in an imperfect world. CEO Technician: What about oil? Can OPEC keep oil above $40/barrel on WTI? Bob Moriarty: Oil is cheap and OPEC is meaningless. CEO Technician: What is the last stock that you bought or sold? Bob Moriarty: That’s a secret. I’m selling an oil stock and using those funds to buy a gold stock that I believe has much higher potential. Overall i’m a buyer of resource stocks down here. CEO Technician: We’ve seen Goldcorp begin divesting multiple assets in Mexico. What are your thoughts on these divestitures and is Goldcorp the smart money seller or are the buyers of these assets able to take advantage of a shift in Goldcorp’s corporate strategy to acquire producing gold mines on the cheap? Bob Moriarty: I’d bet that Goldcorp is getting the best of these transactions. The few deals I’ve seen Goldcorp transact recently I think they’re getting the better of it. CEO Technician: If an investor was new to the sector and had $1,000,000 to put into anything, ranging from physical metal to junior mining shares, what would you recommend that they do? Bob Moriarty: If I had $1,000,000 to deploy I’d go long platinum and short gold. I’d also buy the silver/gold ratio (buy silver, short gold) if it were to get above 80. CEO Technician: Give us some names of stocks you are bullish on and would be a buyer of right here, right now. Bob Moriarty: I like Irving Resources a lot. I have always loved Novo Resources (TSX-V:NVO). I’m picking up some Molori Energy (TSX-V:MOL). MGX Minerals (CSE:XMG) may have an interesting process for turning oil field brine into usable water and extracting the lithium at the same time. If it works, it will be a game changer. If the resource markets don’t turn at once. If they accelerate lower as Tom McClellan says happen at full moons, they either turn or accelerate lower, we are going to have a major stock market crash into October and a buying opportunity of a lifetime in resources. We would like to thank Bob for his time and insights, I know I will be taking a closer look at Irving Resources and Molori Energy. It makes sense that precious metals and resource shares are close to a key inflection point, however, as always it will be the timing of this inflection point that matters most. Bob is convinced that a turn should happen very soon or else we are in for a much deeper decline.